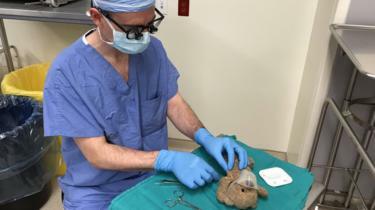 A Canadian surgeon has performed a daring experimental procedure without anaesthetic – on a teddy bear. Although he had no prior experience with stuffed-bear medicine, Dr Daniel McNeely agreed to operate at the request of his other patient. Jackson McKie, eight, was heading into surgery when he asked the doctor if he could also fix his bear Little Baby. Jackson has a brain condition, and Dr McNeely has been one of his primary neurosurgeons since birth. “How could I say no?” Dr McNeely tweeted along with pictures of the bear operation. The tweet has since been shared almost 7,000 times. He diagnosed the toy with a tear in the underarm, and gave the bear an “oxygen mask” during the procedure. Little Baby – who is always at Jackson’s side – was able to grin and bear it. Both patients are recovering after successful procedures. Jackson suffers from hydrocephalus, an accumulation of cerebrospinal fluid. Dr McNeely, who works at IWK Health Centre in Halifax, Nova Scotia, was repairing a shunt. The small tube helps drain the fluid from Jackson’s brain and release pressure. Jackson’s family say they are very grateful the doctor went above-and-beyond to make their son feel comfortable during a scary time. “He was so proud. He had Little Baby laying up in the hospital bed with him and everything,” Jackson’s father Rick McKie told the CBC.